Available in two versions: XS1200 and XS700/B, encloses the typical characteristics for the enjoyment in a sinuous and innovative Lightdesign. It has been conceived to be used both for TV applications and for the live ones. 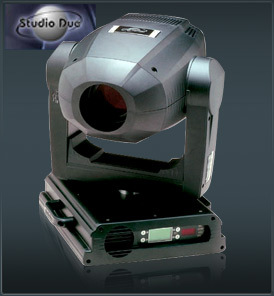 The efficient optic system of condenser lens and recovery dichroic mirror is the heart of the projectors, that combined with a focus and zoom system and an even luminous beam allows you to produce numerous effects. ch14 = gobo B pos.rot. ch15 = gobo A pos.rot.